Oily skin can melt away makeup. That’s why you need the best oil-free and oil-control foundations. Our top picks in this review have a reputation for feeling lightweight on skin and providing a matte finish that lasts for hours. Whether you prefer liquids or powders, there’s something here for you. We chose the best non-comedogenic foundations that hide blemishes and provide smooth coverage that blends in with your skin tone. Before we take a look at these top cosmetics, let’s quickly go over some of the important ingredients to look for as well as ones to avoid. With that said, let’s dive into the reviews of the best foundations for oily skin. Here are our top picks for the best foundations to use if you have oily skin. The Maybelline New York Fit Me Matte Plus Foundation is a miracle in a bottle for people with oily skin. It’s inexpensive and effective. There are 24 colors total to help you find the right tone for your face. It’s water-based and buildable, plus it doesn’t clog up pores. This foundation contains micro-powders that hide pores and absorb excess oil. The result is a matte finish that lasts for hours without needing a touch-up. Clinique’s Even Better Makeup with SPF 15 is a great foundation for people with combination skin. If your face varies between too dry and too oily, Clinique’s got you covered. They sell ten different shades to match your skin, and you can blend two shades together to get a perfect match. Clinique is known for their excellent skin care products that are kind to sensitive skin. The foundation is fragrance and oil-free, it won’t clog pores, and it actually brightens skin tone. If you don’t use a moisturizer with sunscreen, consider using this foundation that has it. Another top foundation that offers protection against UV rays is the Revlon ColorStay Liquid Makeup with SPF 15. It comes in 22 shades that match just about every skin tone. Users say this foundation is smooth and light and stays matte, not shiny, all day long. The coverage is good for a water-based foundation. It doesn’t clog pores or have an artificial fragrance. Customer opinions are divided about the La Roche-Posay Toleriane Teint Mattifying Mousse Foundation. Users who love it are thrilled that it blends into their skin and they feel like they aren’t wearing makeup at all. They say it keeps shine under control for hours. Other customers say it rubs off too easily. One thing to note is that it comes in just five shades, all of which are made for people with light to medium-tone skin. On the plus side, the formula contains no parabens, no fragrance or oil, and it’s non-comedogenic. This luxury facial primer and brightener from jane iredale is indeed a Smooth Affair just as its name claims. It has the company’s proprietary blend, PoreAway, that disguises pores and makes skin texture look flawless. It reduces oiliness and maintains a matte finish on your face for hours without touch-ups. Besides the mattifying effect, the primer contains grapefruit extract for radiant skin and tea extracts to fight signs of aging. The minerals in the formula help it blend into your skin tone perfectly. Once you’ve applied the primer, you can use the PurePressed Base described below as a colored foundation over the top. The PurePressed Base comes in 24 shades that match fair to dark complexions. It’s a powder base designed to be applied over the top of jane iredale’s Smooth Affair Primer. The lighter shades are SPF 20, while the darker shades are SPF 15. Both have broad spectrum protection against both UVA and UVB rays, plus they contain natural ingredients to fight photo damage. In this case, the ingredients are pine bark and pomegranate extracts. BOOTS No7 Beautifully Matte Foundation comes in seven shade for pale to dark-medium skin tones. It’s especially formulated to keep oil under control for up to 12 hours. Users say it makes their skin look flawless even if they have blemishes. The Italian luxury line of diego dalla palma’s cosmetics is pricey but worth it for a lot of customers and longtime fans. The 2 W.W. Oil Free Foundation hides fine lines and leaves your face with a matte, velvety soft finish. Apply one layer of this lightweight foundation for everyday wear, or two layers to cover imperfections. But even with two layers, the makeup doesn’t look caked-on or unnatural. It comes in seven shades to match fair to medium skin tones. It does not contain parabens, talc, or oils, but it does have a host of natural ingredients to pamper your skin. The ingredients list includes Blue Lotus Extract to fight wrinkles and Mallow Extract to hydrate and soften skin. The foundation also provides a small amount of protection against UVA and UVB rays. Diego dalla palma provides some pro tips on how to apply this foundation for best results. They say using a latex sponge creates a flawless complexion. Using a brush makes for a natural, almost not there at all effect. Fixing it with powder can make the matte finish last even longer. Generally speaking, if you have dry skin, powder foundation isn’t the best choice. But folks with oily skin may find that powders give them the best shine-free finish. The Body Shop’s All In One Face Base is a convenient compact complete with pressed powder, applicator sponge, and mirror. The sponge compartment is separate from the powder, and that’s a nice touch. Users say they love this foundation because it provides full coverage that looks natural, not chalky or caked-on like some powders do. You can apply it over bare skin or a primer (for even better results). There are 5 shades total, for ivory pale to sun-kissed bronze skin. You can’t have a review of the best foundations without including a product from Bare Escentuals. Their bareMinerals MATTE SPF 15 Foundation is super popular because it’s so lightweight on skin and gives great coverage. Even better, it comes in 19 colors so you’re sure to find one that matches your skin tone. While the foundation makes you look good by smoothing your texture, controlling oil, and hiding pores, it also goes to work on your skin’s well-being. After regular use, many wearers report clearer, healthier skin. All the of the liquid foundations in this review can be applied with one simple tool, your fingers. But there are some advantages to applying your makeup with a brush or sponge. Using your fingers can lead to depositing more oil and bacteria on your face. It’s also a less gentle method. Using a brush or sponge is more hygienic if you keep them clean. That’s why we recommend buying at least two so you can rotate and always have one ready. This is a flat Kabuki, or stippling, brush for applying either liquid or powdered foundation. The synthetic bristles are silky soft and dense. At this price you can buy two and keep one washed and ready to use. Yes, this is another brand of Kabuki or flat top brush. It’s wildly popular. It has soft synthetic bristles, a wooden handle, and a double-crimped copper ferrule to keep the bristles from coming loose. If you’re not ready for silicone sponges yet, have no fear. Here are nicely contoured latex sponges perfect for stippling on foundation. Their teardrop shape makes them easier to hold and control. How do you clean your makeup brushes? Why not try this brush shampoo that dissolves makeup without leaving residue? A little goes a long way and it only takes a couple of minutes to work. Everyone and their cousin Vinnie has been talking about these little silicone scrubbers for cleaning makeup brushes. Of course, you can still massage the bristles with your hands. But supposedly the silicone scrub boards are less likely to harm your brushes. They’re super cheap and come in a variety of colors, too. Instead of caking on more makeup, simply soak up the excess oil and perspiration with these natural blotting papers. It’s vital to gently clean and moisturize your face at the end of the day. Don’t leave makeup on—even the best non-comedogenic formulas can end up clogging pores with the help of the grime that builds up on your skin during the day. What goes on must come off. Remove your makeup gently and thoroughly with these wipes from Neutrogena. They even dissolve waterproof mascara. If you want to avoid chemicals and keep waste out of the landfill, check out these microfiber makeup remover cloths. They are washable and reusable and oh so soft. 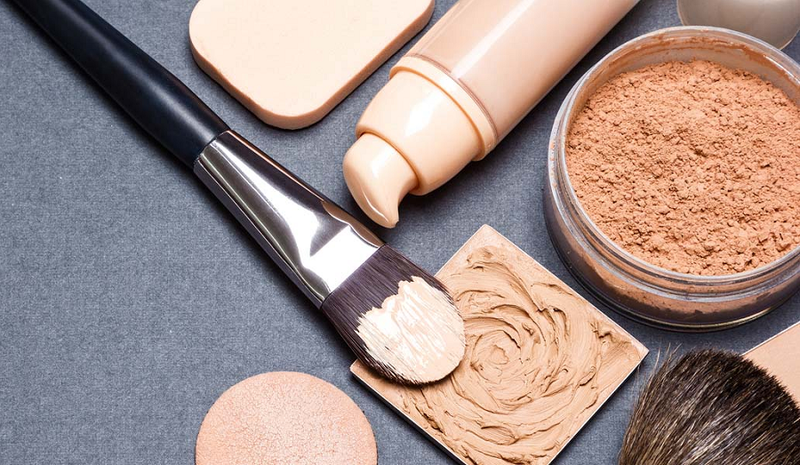 We consulted the experts and learned these important tips for applying makeup foundation so that it looks perfect on you as well as perfectly natural. The most flawless application of foundation enhances your natural beauty without looking caked on or artificial. It hides the uneven skin tone and blemishes that everyone has at one time or another so that you’re ready to face the world with confidence. It’s best if you don’t have to rely on blending your own custom color. Don’t settle for testing it under fluorescent store lights. Get into daylight put some of the foundation on your jawline. See if it disappears against your skin. If you can wear a powder foundation, not just a liquid, consider going with only powder during summer months because it’s less prone to melting from transpiration plus it usually has a measure of sunscreen in it. Check the undertones to make sure they match your skin. This means you need to know if you have warm or cool undertones. Warm-toned skin looks peachier or yellower. Cool-toned skin is pinkish or bluish. One quick test to know is by looking at the veins in your wrist. A green cast means warm-toned skin. A blueish or purplish cast means cool-toned skin. After you wash your face and apply moisturizer, wait five minutes for that to sink into your skin. Then apply the foundation. You might choose to apply primer, then foundation, if you have a long day ahead or have extra oiliness or large pores to disguise. Go the extra mile and exfoliate your face once or twice a week. Removing dead skin makes for an even more flawless complexion. Fingers are okay for applying foundation—just wash your hands first. But if you need better coverage, use a brush or sponge to smooth on foundation. Dab extra amounts over blemishes. Begin at the middle of your face and work outwards and downwards, even over your ears and down onto your neck so you don’t leave a mask-like line. When using a brush, apply foundation with downward strokes so you don’t fluff up any fine hairs on your face. If your foundation can be applied over your eyelids (some can’t), take advantage of that fact to hide those little veins. Concealer can put a final kibosh on stubborn pimples you want to hide. A light dusting of powder, especially translucent powder, can set your foundation and add radiance. Pat a thin amount from your hairline down to your cheekbone, across your nose, and back up to the hairline on the other side. If you ran out of concealer, put a dab of foundation on top of the blemish, then wait a couple of minutes for it to dry a bit before you blend it. Even if you prefer brushing on foundation, keep a sponge handy. Just like when you paint a wall with a brush, you might leave brush strokes in your foundation. A sponge can help you buff out the stroke marks. Many of us are paler in the winter and sun-kissed in the summertime. You may need more than one color of foundation to accommodate the change in seasons. Instead of dipping that big brush into that tiny bottle of foundation, put a drop of foundation on the back of your hand and dip your brush into that. Maybe your foundation still looks fabulous, but your eyeshadow is fading into non-existence. (Did you forget your eye primer?) No worries, you can touch up your eye makeup, but be careful not to spill the powder onto your cheeks. Use an eye shadow shield or at least a tissue to protect your skin under your eyes from a dusting of color. Instead of adding more foundation when yours starts to falter, invest in and carry around blotting papers like the ones in the Accessories section above. A few gentle presses can take you from shiny back to matte-fresh. Pamper yourself and learn to apply your makeup as expertly as possible. With practice, your method for applying foundation will become second nature. We hope that our guide to the best foundation for oily skin helped you find the perfect products you need for flawless makeup. Come back soon for new reviews of the best in personal care today.